Let's start with a basic definition of a probe: Any controlled-impedance structure that conducts electromagnetic fields and can sample a portion of a signal with minimal impact for diversion to a measurement device. Sample: Needs to sense a small portion of the signal and divert it to a measurement device, possibly providing gain in the process. Having said all of the above, we could consider any slender, pointy metal object to be a probe (like a paper clip, sewing needle, or safety pin). Such objects will conduct an EM field, and we may even be able to calculate their impedances. But even so, they won't make for very good probes. The first challenge we tackle with probes is connectivity. 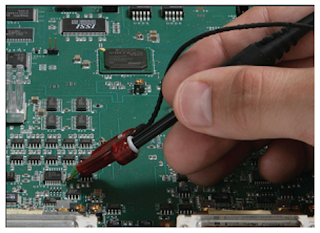 On the back end, probes mate with oscilloscopes by way of coaxial inputs, whether SMA, BNC, K-type, or what-have-you. Most often, we use our probes to make contact with signals on printed-circuit boards (PCBs), and most of the PCBs we work with don't have coaxial connectors installed on them. Rather, there are traces, vias, and sometimes non-standard connectors of some fashion. Fortunately, there are a number of means by which we may reliably connect our probes to PCBs. One possibility is designing the board's layout to include surface-mount coaxial connectors. Of course, this route comes at the price of the connectors themselves as well as board real estate. The latter, especially, may be a precluding factor, considering that there's also a design time-to-signal integrity tradeoff involved. 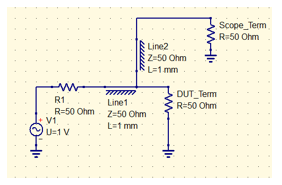 But the best option for signal fidelity is to design connectors into the board. Another option is to use a test fixture to fan out the various signals on the board. These devices are most typically used in characterization or compliance test environments and can be found in formats such as USB and SATA. However, in a large number of cases, signals are simply inaccessible from a connector of any sort, but rather travel from point to point on the board. This leads us to general circuit debugging applications that involve non-standard interfaces and require probing on board-mounted components. One approach to connectivity is to use interposers, which can be developed for standard ASICs, DDR memory chips, or custom ASICs. Another cruder and more destructive method is to cut the trace carrying the signal of interest and solder down a coaxial cable to the test point (Figure 2). It's a simple, somewhat brute-force approach that works, but at a potential price of a termination mismatch and less-than-ideal probe loading of the circuit. Consider an example of the above method that concerns a 50-Ω terminated line with a 50-Ω transmission line connecting this signal to an oscilloscope with a 50-Ω termination (Figure 3) We end up with an effective loading resistance of about 25 Ω, which results in a 33% gain error. This situation might suit some narrow-band signals such as clocks or oscillators, but it will not suffice for a general-purpose debugging application. 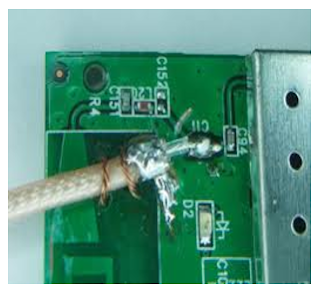 With their relatively narrow frequency content, it may be feasible to probe a sine wave using the soldered-down coax method, once we correct for gain error. But when it comes to something like a serial-data signal, with its much larger frequency content, it would be near impossible to match impedance over the required bandwidth. This is where a proper oscilloscope probe comes in, allowing us to capture signals over a wide frequency range. Probes are available in extremely high bandwidths, with controlled impedance over that full range. They present low loading to the circuit and come in many form factors. Most importantly, probes will not require destructive methods such as cutting traces. In our next installment, we'll begin a deeper dive into probe specifications.